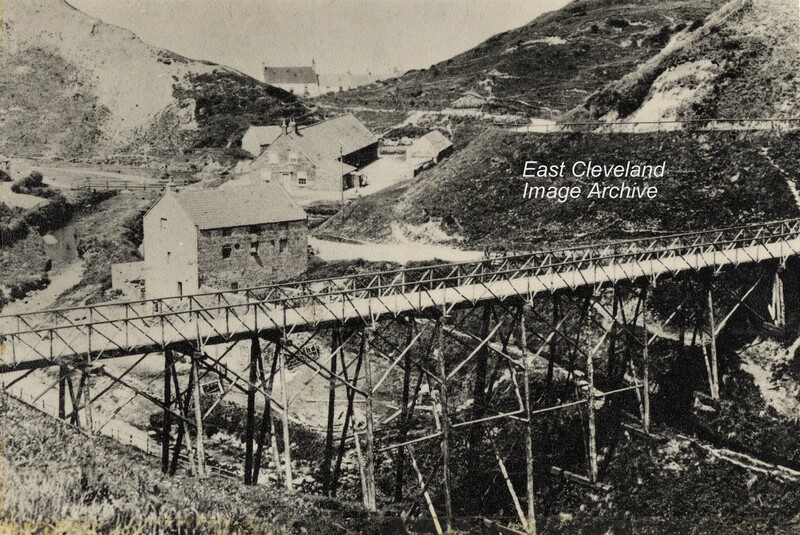 Dated 1890 this image shows the Miner’s Bridge which spanned the stream and narrow valley of Saltburn Gill, the bridge was used by those miners who lived in Saltburn and worked at the Huntcliffe Mine (today the only remaining part of the mine is the Guibal Fan house close to the railway line). The miners crossed the Saltburn valley (and Skelton Beck) via the Halfpenny Bridge and then crossed Millholme Beck via this footbridge. The footbridge was demolished in 1906 after the mines closed. The mill at old Saltburn had become inefficient in 1902 after the more powerful steam-driven mills came into use at Yarm; the mill was demolished in 1905. Image courtesy of Iris Place; information courtesy of ”Saltburn-by-the-sea” compiled by Joan Wiggins; thanks to Julie Riddiough for the update, as well as Chris Twigg and Ian Scott for their comments.